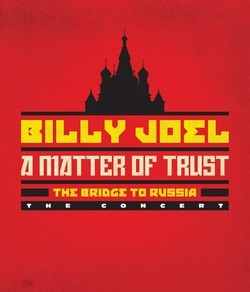 Billy and his band's performance of "The Longest Time" in Russia in 1987 was officially released on 2014's "A Matter of Trust: The Bridge to Russia," but was not on 1987's Kohuept or the 1991 concert video "Live from Leningrad." Download "The Longest Time (Live-Russia)"
The imminently hummable and unforgettable melodies of An Innocent Man made it one of Billy's most popular albums, and "The Longest Time" may be the most enduring of these tunes. The acapella song, an homage to the doo-wop groups of the 50s and 60s, became an instant hit among high school and college choirs and acapella groups. The song reached #14 on the charts and is still frequently performed by school groups. This was "Glee" material before there was "Glee." Ironically, it was not (yet) used on "Glee" though other Billy Joel songs have been featured on the television series. This is a song you can't get out of your head whether you like it or not. Impressively, Billy does all of the vocal parts, and the only instruments used are a bass and hi-hat. Who would have though an acapella song with almost no instrumentation could be a hit in the 1980s among all the new wave and synthesizer-music that was coming out? It's a testament to the fact that a good melody will find listeners, of all ages; there is always room for a good melody. The music video to "The Longest Time" was also a fun bit of make-believe nostalgia, and is one of the few Billy Joel videos to feature his band. In the video Billy portrays a middle-aged man at his 25th high school year reunion. He is sitting in the gym at the end of the party, when suddenly he hears his old high school buddies singing this song. He joins up with them and they are then magically transported back in time to the way they looked back in high school. It reminds me of the movie When Peggy Sue Got Married (1986). Like the other videos from the album it is utterly enjoyable and a guilty pleasure (though I'm a bit uncomfortable about the end when the African American janitor does a double-take). Original music video for "The Longest Time" (1983).